Scooper - Technology News: What do the next 25 years hold for the ASEAN region? What do the next 25 years hold for the ASEAN region? At the heart of Asia sits the dynamic region of ASEAN, also known as the Association of Southeast Asian Nations. Originally convened to address geopolitical stability in the area, this regional bloc has evolved a great deal since its inception in 1967. Now 49 years old, it has expanded from its original five member nations to include 10 states, and its focus has shifted from regional security to pioneering trade agreements and a new economic community, keeping pace with an ever-changing global context . Like all countries and regions, ASEAN faces tremendous challenges. Arguably the most significant is the impact of digital technology on governments, businesses and communities, otherwise known as the Fourth Industrial Revolution . As a plethora of new technologies takes hold – advanced robotics, artificial intelligence, 3D printing, autonomous vehicles, machine learning and the internet of things – the region must learn how to grasp new opportunities but also how to navigate the very real risks of being left behind. Traditional development paths for countries are changing, from export-based manufacturing to providing digital services, with big implications for the future of jobs. Teachers will have to become digitally literate, says Kathleen Chew in her article on Asia's struggling schools , in order to equip the young with the skills they need in a modern economy. There should also be a special focus on the inclusion of girls and women , says Anne-Birgitte Albrectsen, CEO of Plan International, if the region is to reap the economic dividends of women's participation in the workforce. Currently, Asian women are working a double shift of underpaid day job and unpaid domestic duties, writes Oxfam's Trini Leung . As the cost of automation plummets, the region will struggle to compete on the back of low-cost labour alone. Unemployment among the young is already at 10%. The answer, according to the World Economic Forum's Saadia Zahidi , lies in new digital technologies and the opportunities they present to those savvy enough to train in computer science, engineering and business. Other sectors, too – from financial services to healthcare and retail – will be disrupted beyond recognition. 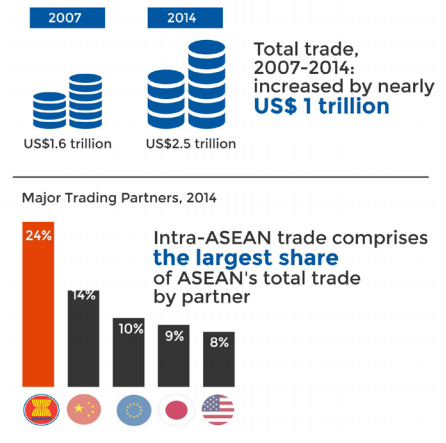 ASEAN’s home-grown financial services firms can spread to neighbouring countries thanks to blossoming regional integration; while the retail sector is poised to grow – but only if it keeps pace with changing consumer demand, write Ali Potia and Jaana Remes in a blog detailing Asia’s three consumer tribes of the future . The healthcare sector, too, will be transformed by new technologies. These could make it better and more sustainable, but only if governments are judicious and avoid the mistakes made by more developed countries, writes Harald Nusser, warning of the health risk of increased urbanization . Will policy-makers be quick enough to respond? Can they reshape education systems to ensure today’s children are equipped for tomorrow’s jobs? Can they ensure growth is inclusive and fair? And can they harness the power of new digital technologies to improve standards of governance and institutional quality, which will be so vital to economic success? The question of how ASEAN will navigate the challenges ahead is both fascinating and critically important. At this year’s World Economic Forum on ASEAN , taking place in Kuala Lumpur on 1-2 June, we’ll be bringing together heads of government and key ministers from across the region, as well as global CEOs, leading academics and international organizations – to debate the big questions and to help shape the agenda for the next 25 years. Before that happens, however, we’ll be publishing a series of articles that offer context on the issues being addressed. You can read them all here .